A Naval Intelligence officer once told me: “I know a coded book when I see one. And the Bible is a coded book.” That conversation may have planted the seed in my mind which eventually grew into questions, research, and roughly fifteen years later, the sudden mental breakthroughs that clarified how I would correctly interpret prophecy. Before those insights, despite studying many sources of prophecies on end times events including the Bible, the Mayan calendar, psychics like Nostradamus and Edgar Cayce, and the temples, texts, and myths from Egypt and India and other ancient cultures – I couldn’t see any unifying conclusion. Different sources didn’t seem to be saying the same things. It seemed obvious that unless they were all in agreement, most of these sources must be wrong. Anyone who values the wisdom of ancient civilizations must wonder why every culture has different beliefs. Agnostics doubt anything requiring divine revelation. Christians often assume that if prophecies do not agree with the Bible, they can’t be right. But if there is a single future to foresee, all valid prophecies should tell us the same things about the end of the world. Eventually I realized that many sources are telling us the same stories; that many “different” prophecies are really in agreement. It took years for me to determine which cultural differences were important and how to recognize crucial similarities. It was like watching half of a foreign film before realizing it is probably the original version of a movie I already knew. For most readers any comparison of varied sources of prophecy is like the fable of the blind men and the elephant. Several men who are either blind or in the dark each touch one part of an elephant (without knowing what it is) and compare notes. Of course after feeling a tusk, a leg, an ear, the belly, and the tail, they are in complete disagreement over the details and argue about the unknown thing between them. A king explains that they are all correct; that they have unrelated descriptions because they are touching different parts of an elephant. ...different cultures all tell us stories which are meant to be understood from an astronomical point of view. The night sky is like an enormous clock, and ancient cultures describe unique arrangements of heavenly bodies to show us when future events will occur. The second key to understanding end times prophecy is discovering any particular culture’s grand climax event and interpreting it astronomically. Christianity’s climax event – the filter through which the Bible’s end times prophecies should be viewed – is an ancient Jewish wedding ceremony between Christ and His bride. Bible prophecy is much easier to understand if we shift our focus from events in ancient Israel and direct our attention to the future wedding in the sky. No religious beliefs are necessary to understand that the Bible has encoded astronomical information detailing the timing of an apocalypse in our near future. This is not to say that the traditional understanding of the Bible is wrong or irrelevant – but the astrotheological interpretation of the wedding ceremony is what will give us the clearest timing of future events. The Bible has an end times message for us if we accept that it describes a Jewish wedding ceremony with astronomical bodies as the main characters. The ancient Maya tell a similar story and the end of the Mayan Long Count (“Calendar”) on 12/21/2012 is the exact start of the Bible’s seven year tribulation – because both cultures were focused on the same astronomical events. 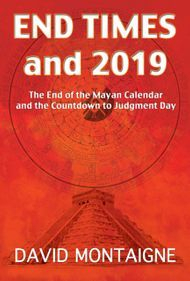 Many people know the Mayan Long Count ends in 2012 but few realize the Maya described the positions of astronomical bodies at the end of the world, and that the positions described for the planets are not accurate for 2012. They do match what will be seen in December 2019. The seven transitional years in between worlds can be viewed as the last years of the current world (as Christianity views the Tribulation) or as the first years of the new world (as the Maya view them.) Either way, the end of the world as we know it is imminent. 1) You're already looking at it so you must have an interest in these topics. 2) Montaigne introduces you to other researchers/authors that you will want to know more about. Graham Hancock, Charles Hapgood, Robert Schoch, Paul LaViolette, John Michell, and many others. 3) He makes us think about old information in new ways. Why do so many bible passages seem to describe a pole shift? Why are there so many astronomical references in the bible? Why do those descriptions match the positions of heavenly bodies in the night skies EXACTLY seven years after the end of the Mayan Long Count in December 2012? Why do the movements of the sun and planets correspond to the major steps of an ancient Jewish wedding ceremony for the week starting December 21, 2019? Chapter 7 - When was Jesus Born?